A large pot brimming with plants can revitalize a patio in winter. Start with a small shrub or perennial from a 1-gallon nursery pot, and smaller plants from 4-inch pots. Good choices include primroses and violas. Step 1: Fill the pot with enough soil so that the top of the large plant’s rootball sits about 2 inches below the pot’s rim. Mix in a complete fertilizer according to package directions. Tamp soil lightly. Loosen coiled roots and position the large plant in the pot’s center. 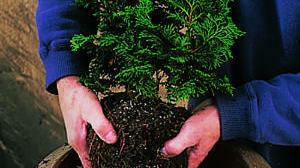 Step 2: Add more soil around the large plant, then arrange the remaining plants, also to sit 2 inches below the pot’s rim. Fill in remaining gaps with soil and water well.